What’s Happening in York This New Year’s Eve? New Year’s Eve York: Wondering where to see the drop in York, PA? As the ball drops in Times Square in New York City, the white rose drops on York’s Continental Square. That’s right: We do things a little bit differently at New Year’s celebrations in York, PA. Hosted by White Rose Credit Union, New Year’s Eve in York features free noisemakers and hats, as well as a fireworks show immediately following midnight. 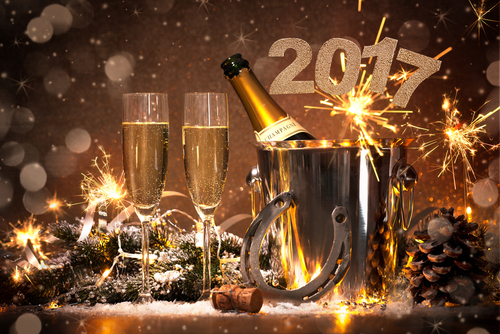 Ring in 2017 on Continental Square with a few of your closest York friends. New Year’s at the Vineyard: For the wine lovers looking to celebrate New Year’s in York County, stop by the Spring Gate Vineyard and Brewery between 7 p.m. and 1 a.m. There’s lots of fun to be had, and plenty of spirits to imbibe when you visit this local establishment. New Year’s Eve at Noon: Get a head start on 2017 when you visit the National Watch & Clock Museum from 10 a.m. to 1 p.m. on Dec. 31. The Museum hosts New Year’s Eve at Noon at its Columbia location, with activities created specifically for local children. Young visitors can learn about the passage of time in a child-friendly fashion, and a balloon drops at high noon so that our kids can celebrate New Year’s in York County, too. Guests can make their own hats, pose for photos, play trivia games, create a time capsule, decorate cookies and much more. Children’s Countdown: Another activity for our young people, the Children’s Countdown takes place from 6 to 8 p.m. at Central Market House in York. This free event includes kid-friendly entertainment and activities, as well as a balloon drop at 8 p.m. sharp. Stop by and bring the kids before heading out to a more adult-focused New Year’s celebration in York, PA. The Rocky Horror Picture Show: The Strand Capitol Performing Arts Center presents a cult classic — The Rocky Horror Picture Show. Stop by at 9:30 p.m. to take in this presentation and enjoy a slightly non-traditional New Year’s in York County. Are you just getting to know the York County area? At CENTURY 21 Core Partners, we know York and surrounding communities inside and out, and we’re always glad to help you get to know this part of Central Pennsylvania — including what you can do to make your New Year’s Eve memorable. Real estate is our work, of course, but our passion is the people of York, PA. Contact us today with questions about York, real estate or otherwise.